Ten seasons in one would think The Big Bang Theory would be running out of steam, but this love it or hate series (I’ve found a lot of people just don’t get it, but obviously a lot of people do) just keeps on chugging. They cast are already signed on for more seasons and the eleventh season is about to kick off, but until then fans can binge this funny tenth season that brings some major life changes for the quirky characters. In recent seasons we’ve already seen nerdy genius Leonard (Johnny Galecki) marry Penny (Kaley Cuoco) in one of the more unlikely couplings in sitcom land. This season creepy mop-top wearing engineer Howard (Simon Helberg) and his deceptively sweet wife Bernadette (Melissa Rauch) welcome a child to their marriage. Still, it’s annoying know-it-all theoretical physicist Sheldon (Jim Parsons) and his girlfriend Amy (Mayim Bialik) who steal the show with their awkward nearly asexual relationship as they embark on an experiment to live together when Amy’s apartment floods and she seeks a place to stay. The season is filled with many other madcap adventures and events such as Sheldon, Howard, and Leonard being recruited by the military for a classified project and Raj’s (Kunal Nayyar) attempt to glean from his ex-girlfriends why they all broke with him. As usual each episode is packed with enough pop culture references to make one’s head spin, like one particular episode where two characters run through their list of favorite defunct search engines. The season ends on a cliffhanger that surely will have fans anticipating the season 11 premiere. "The Gates Excitation" Pictured: Rajesh Koothrappali (Kunal Nayyar), Howard Wolowitz (Simon Helberg), Bernadette (Melissa Rauch), Sheldon Cooper (Jim Parsons), Amy Farrah Fowler (Mayim Bialik), Leonard Hofstadter (Johnny Galecki) and Penny (Kaley Cuoco). Penny gets the opportunity to host Bill Gates at work when his company wants to partner with her pharmaceutical company. 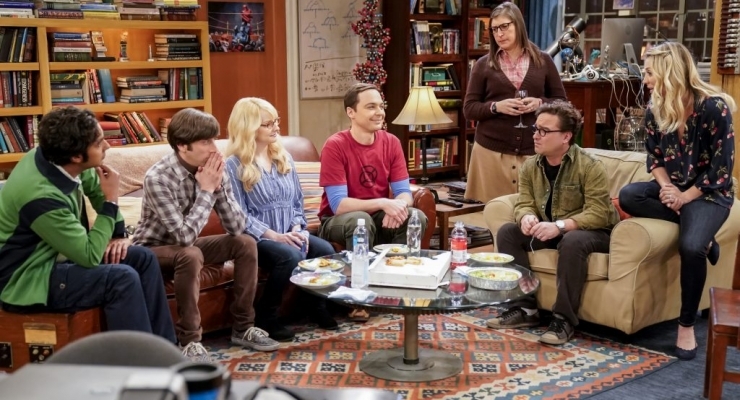 Also, Leonard, Koothrappali, and Wolowitz do everything in their power to meet him, while Sheldon thinks he is the victim of an April Fools prank, on THE BIG BANG THEORY, Thursday, March 29 (8:00-8:31 PM, ET/PT), on the CBS Television Network. Photo: Erik Voake/CBS ©2018 CBS Broadcasting, Inc. All Rights Reserved. Ever since season 7, The Big Bang Theory has been shot in HD on the Sony F55 camera. It arrives on Blu-ray in an AVC 1080p encodement from Warner Bros. that looks just as crisp, colorful, and clean as the series always has on Blu-ray. Being a sitcom there isn’t much artsy color coding or shading to discuss. It’s just a natural and bright image that is a big step up over all streaming and broadcast versions thanks to an absence of the compression noise and motion artifacts those formats tend to introduce. As with previous seasons of The Big Bang Theory on Blu-ray, season 10 comes with a lossless DTS-HD Master Audio 5.1 mix that is solid for offering clear, clean, full dialogue, but little beyond that. The stereo imaging is narrow and atmospherics in the surround channels are mild – they are really only heard during the scene cut sequences or the laugh track. 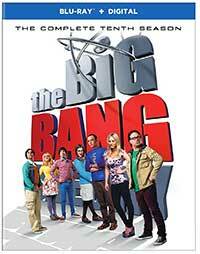 The Big Bang Theory: The Complete Tenth Season comes with the standard issue special features offering up behind-the-scenes featurettes with the cast, creators and crew and a fun Comic-Con panel as well. Best of TBT 2016 Comic-Con Panel (HD, 39:13) – Writers’ Panel at the 2016 San Diego Comic-Con. #JustAskBBT – The cast answers fan questions from Twitter. The Ever-Expanding Universe of The Big Bang Theory (HD, 11:22) – Show creator Chuck Lorre, executive producer Steve Molaro and the cast discuss the highlights of Season 10 and how family played a key role in this season’s storylines. Mad Props (HD, 07:59) – The show’s father of invention, prop master Scott London, reveals the origins of some of the most iconic props from the first 10 seasons. Who’s the Baby Now? (HD, 07:33) – Show creator Chuck Lorre, executive producer Steve Molaro and cast discuss the show’s newest addition, baby Halley Wolowitz. This series’ send-up of pop culture references and geek culture shtick may no longer be fresh, but it still brings in the laughs and, more importantly to the network perhaps, the ratings. The cast definitely has chemistry and knows these characters inside and out. Season 10 is at times a laugh riot, even when you know what they are going to make fun of. This Blu-ray set on two-discs is a solid sitcom release. The laughs keep rolling for this geek culture send-up in a season that brings big life changes for the TBT gang. Filed Under: BD & UHD BD, Comedy, Warner Home Video Tagged With: Comedy, Jim Parsons, Johnny Galecki, Kaley Cuoco, Sheldon, Sitcom, The Big Bang Theory, The Big Bang Theory Season 10, Warner Bros.